You may have heard that Politicians, social activist, Human Rights organizations, students, and farmers are on road protesting against the government and demanding different things but you have never heard that scientist are on road and demanding for their rights. Probably, first time in history of Independent India, scientist, researchers and research scholars held a rally ‘March for Science’ in Delhi today evening and marched from Mandi House to Parliament Street to register their disappointment against the government’s apathy towards the science, research and higher education. During the protest they demanded for hike in research budgets, budgetary allocation for education, research and technological advances in publicly funded institutes and organizations, increase science based education and so on. More over they were changing, spend 3% of GDP for Science!, spend 10% of GDP for Education to educate the next generation!, stop spreading unscientific beliefs, science not Silence, Science for Society, Science for Man, Science in Thinking! etc. 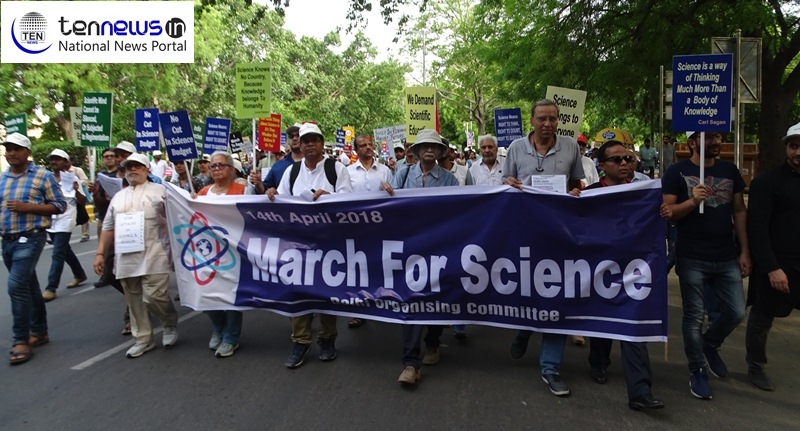 Scientists, professors, teachers, research scholars, students and science loving people and students from llT, lGlB, DU, JNU, Ashoka University, Ambedkar University and different scientific institutions took part in the march. While the Prof Joyshree Sengupta of AllMS said, “The government who made tall claims about enriching higher education, research based education and advice scientists to innovate new technology is just a gimmick. How scientist can do it all without having infrastructure, funds and higher education? “Since inception, this government have been targeting higher education institutes and contently trimming down the Phd seats, axing budgets and propagating mythology with the science.” She asserted. Prof. Dhruv raina of JNU, Prof Joyshree Sengupta of AllMS, Prof Raghunandan of AIPSN, Prof Pradipta Banerjee of JNU, Sarada Dixit of Narela, Dr. Vinay Kumar, Anubha of AIIMS had participated in the protest. 1. Stop propagation of unscientific, obscurantist outdated ideas and develop scientific temper, human values and spirit of inquiry in conformance with Article 51A of the Constitution. 2. Ensure that the education system does not impart ideas that contradict scientific evidence. 3. Enact policies based on scientific evidence. 4. Increase budgetary allocation for education, research and technological advances in publicly funded institutes and organizations. खुले में चूल्हा-चौका लेकर बैठे इरोज सम्पूर्ण सोसाइटी के निवासी, बिल्डर पर गंभीर आरोप लगा किया प्रदर्शन!